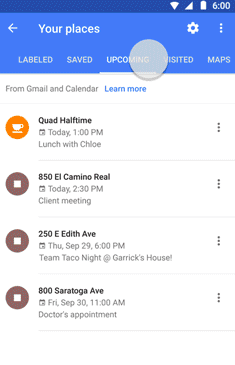 The latest version of the Google Maps app for Android adds more integration with Google Calendar. There's a new upcoming tab in "Your places", which shows a list of upcoming events, including your bookings and reservations from Gmail. Click an event to quickly see the location on the map. There's also a new "personal content" section in the settings, which lets you disable the integration with Google Contacts, Google Photos, disable location, location history and search history. Google has a new blog that merges 19 of its most popular blogs, including the Official Google Blog, Gmail's blog, Google Drive blog, Chrome's blog, Android's blog and more. You can find it at blog.google and it's called The Keyword. 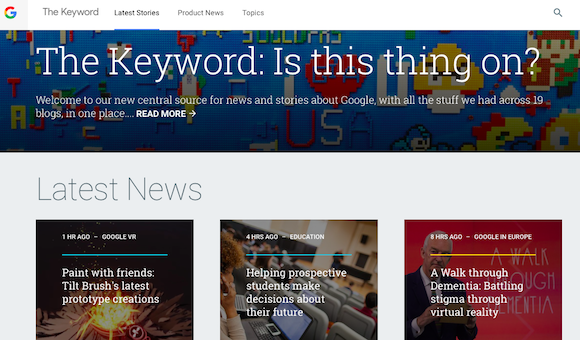 "We wanted to make it easier for people to find news from Google about what we're up to. With that in mind, today we're launching the Keyword — a new destination for the latest news from inside Google, from Android to Translate. The Keyword is all the stuff we had across 19 blogs, in one place — so you don't have to hop from one blog to another to find the latest update. If you're looking for something from Google from now on, chances are it's here," mentions Emily Wood. The most interesting thing about this change is that Google abandoned Blogger and uses a completely new blogging platform. There's a section that showcases the latest tweets from Google's main Twitter accounts, a list of the latest stories and news. You can filter blog posts by Google product or by topic and you can use the same filters for search results too. Bing has a cool feature: just click the search box and you get a list of trending searches. Google has been testing a similar feature this year in the mobile search interface. It started as an experiment in the Google Search app for Android back in January and now I noticed the same experiment when visiting Google.com in Chrome. 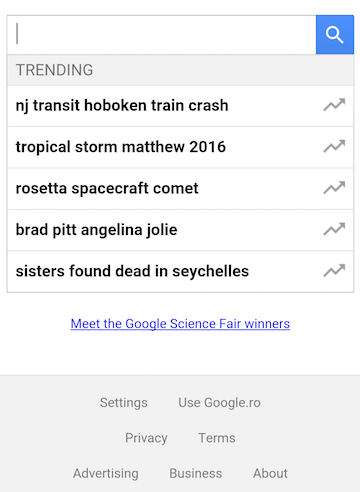 Google shows 5 searches that are currently popular and most of them seem to be related to recent news. Obviously, Google's results include a lot of news articles. "The difference between trending and normal auto-complete is basically the difference of showing search suggestions based on years of query history vs the past 48 hours of search query history (in the most simplistic way)," says Barry Schwartz, who reported about this last month. 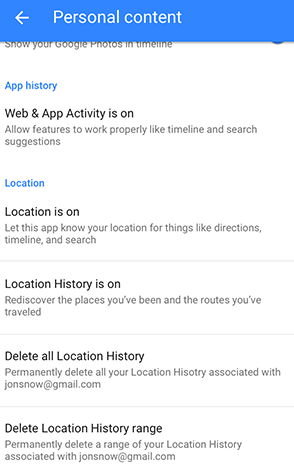 Google launched the "plan a trip" feature for mobile phones back in March and now it's available in the regular desktop interface, as well. 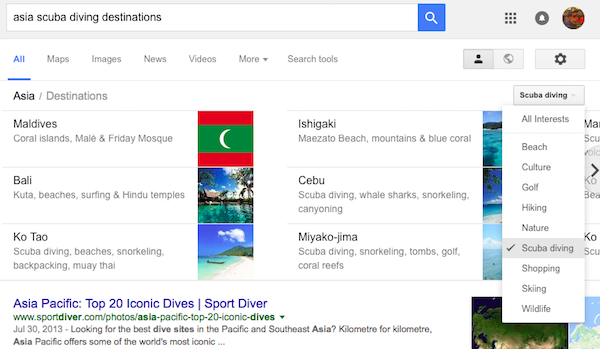 "Destinations on Google helps you discover and plan your next vacation, right from Google Search," informed Google. 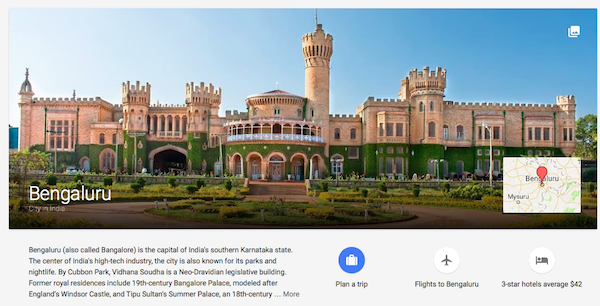 Search for a continent, a country or state you'd like to visit and the Knowledge Graph card has a "plan a trip" section which includes a travel guide, information about hotels and upcoming events. 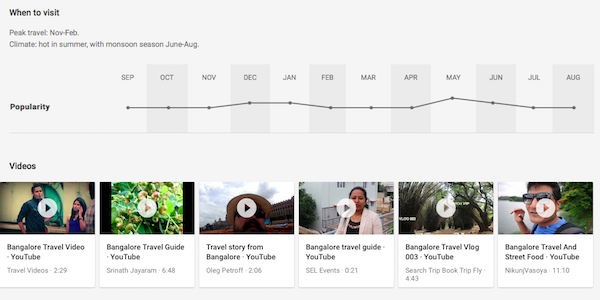 The travel guide link sends you to a new Google Destinations site which shows beautiful photos, a short description of the place, links to Google Flights, Google Hotel Finder, a trip planning feature, a list of suggested itineraries, top sights, videos, related places, information about climate and the most popular months to visit the place you picked. 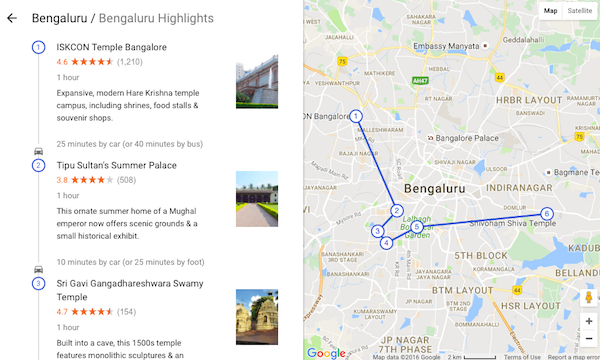 Google displays a list of popular itineraries which are generated from the historic visits of other travelers. The trip planning feature is quite clever. 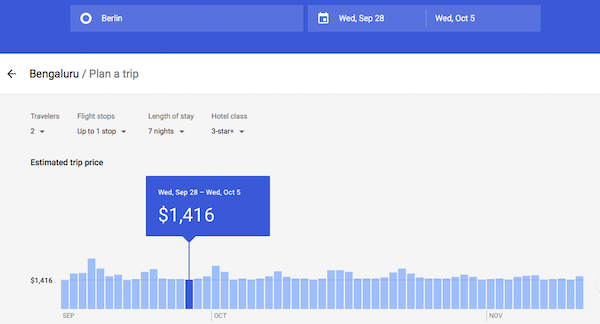 Google shows "highs and lows for the next six months, so you can find the right price tag for you. And as you slide left or right, the results instantly update with real-time fares and rates, pulling from the trillions of flight itineraries and hotels we price every day on Google Flights and Hotel search. You can also customize results further with flight and hotel preferences, including number of stops, hotel class, and number of travelers." 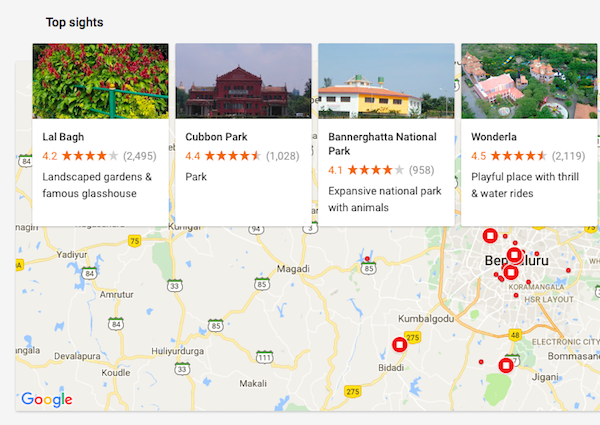 Google Destinations also works for queries like [asia destinations], which shows popular destinations and lets you filter them by interest: beach, culture, golf, hiking, nature, scuba diving, shopping, skiing, wildlife. 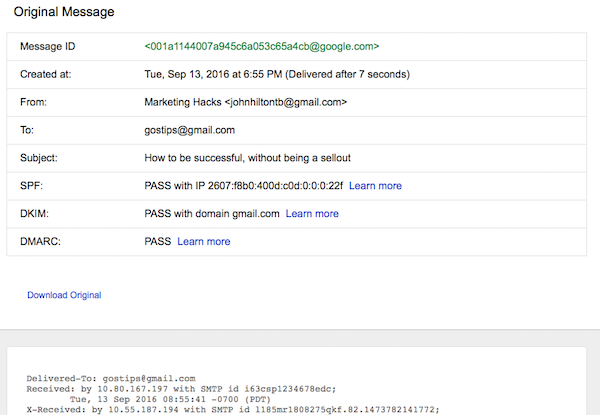 Gmail has a new interface for displaying the raw version of a message. If you click the arrow icon next to "reply" and then "show original", you'll see a list of headers like "message ID", "from", "to", "subject", "SPF", "DKIM", a link for downloading the message and then the actual text of the message. Until now, Gmail only displayed the text of the message. The new interface also displays help center links with additional information about SPF records, DKIM signatures and the DMARC standard. All of these values are useful for identifying spoofed email messages, which forge the sender address.